Long term protection of wood can only be achieved if the heartwood durability (TPAA Technical Note #5) is appropriate for the end use and the sapwood has been penetrated by wood preservative. A number of treatment processes have been used since before the time of the Egyptians and new technologies are being developed all the time. The Australian Pesticides and Veterinary Medicines Authority approves the wood preservative chemicals that may be used in Australia, and Australian and New Zealand Standards specify the concentration of a particular preservative and how deep it has to penetrate into the wood to protect it from the expected biological hazard to which it will be exposed. Vacuum/pressure impregnation (VPI) is an industrial process and involves sealing the timber in a vessel capable of withstanding high levels of vacuum and pressure. Various combinations of vacuum, pressure, time and solution concentration are used to achieve the desired level of protection (TPAA Technical Note #2). VPI processes are used to apply copper-chromium-arsenate (CCA), copper quaternary (ACQ), copper azole (CuAz) and boron based preservatives. Double vacuum processes, are industrial processes used with Light Organic Solvent Preservatives (LOSP). LOSPs are applied to products that are to be used out of ground contact e.g. cladding, balustrading and joinery. 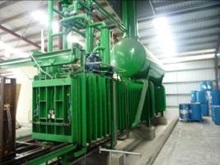 The timber to be treated is enclosed in a treatment vessel and subjected to different cycles designed to achieve levels specified in the Standards. Preservatives include tebuconazole/propiconazole (teb/prop), tri-n-butyl tin compounds (TBT), and synthetic pyrethroids (Sp). Diffusion processes are those in which the preservative diffuses via the water in the wood cells. The wood is treated wet (green) and since the preservative does not chemically react with the wood to become insoluble, the process is used to protect against attack where the wood is not exposed to weather and wetting. The wood treated in this way is used for products such as furniture, flooring and moldings. Diffusion preservatives are also used for remedial treatment, e.g. at the ground-line in utility poles. Boron based preservatives are used in diffusion processes. Glueline treatment. In this case, the preservative is added to the glueline of products such as plywood, chipboards and laminated veneer lumber during manufacture of the product. Material treated in this way is protected against insect and termite attack. Envelope treatments are used to protect timber against termite attack. The treatment process is used on framing timbers and is effective because the preservative is a repellant as well as an insecticide. The processes used cause the preservative to penetrate 2 – 10 mm into the wood. Brush-on treatments Wood preservatives applied in this way will only penetrate the wood to no more than 3 mm. This type of application should only be used if no other form of treatment is possible and the timber product is in its final shape or form. If the timber product treated this way is exposed to the weather, then treatment should be regularly reapplied. According to Australian Standard AS/NZS1604 parts 1 to 5, any product claiming to be preservative treated must be branded as specified in the standard. An important part of the brand is the Hazard Class, which indicates the service conditions to which the product is exposed and the level of treatment or level of protection that must be applied to the wood. All preservative formulations used in Australia must but be approved for use by the Australian Pesticides and Veterinary Medicines Authority or APVMA. There are two important features of an APVMA approval. Firstly, the approval only applies to wood actually treated in this country. There may be preservative treated wood sold in Australia that has been treated with a preservative not approved by the APVMA. In this case the actual treatment process was not carried out in Australia. Secondly, the APVMA approves a label which sets out how the preservative may be used: In effect, this means that members of the public will not be able to buy the actual preservative. Wood preservatives may be dissolved in water, oil, or a light organic solvent such as mineral turpentine. This allows a preservative to be classified into one of these three main groups. The list below covers only those preservatives that are used to treat wood to the specifications in Australian Standard AS/NZS 1604* Specification for preservative treatment. There are five standards in this series dealing with different wood products e.g. sawn and round wood, plywood, particleboard etc. Water based preservatives (The correct term is ‘water-borne’) Timber treated with this group of preservatives has a wide variety of applications, both indoors and outdoors, for residential, commercial, and industrial uses. • Copper Chrome Arsenate, also referred to as CCA, and the treated wood is green in colour. • Copper Quaternary or ACQ, turns the wood green but a different shade compared to CCA. • Copper azole (CuAz) turns the wood a brown-green colour. CCA, ACQ and CuAz react chemically with the wood, making them insoluble and so suitable for use in situations where the treated wood may be exposed to the weather (wetting and rain). This set of preservatives is effective in protecting wood from attack by borers, termites and decay. Boron-based preservatives are water soluble and do not become insoluble after treatment. Because of this, products that are protected with boron-based preservatives can only be used in situations where the wood does not get wet. Whilst boron-based preservatives have some ability to protect against rot or decay, this sort of protection is not usually needed because the boron protected wood is used in dry situations (e.g. flooring) and rot or decay does not occur in dry wood. • Tributyl tin naphthenate or TBTN. This is a fungicide (stops decay or rot) and leaves the wood colourless. This preservative must include one of the termite protections (insecticides) listed below. • Copper naphthenate or CuN. This product is being increasingly used in the US, turns the wood green and is a fungicide only. This preservative must also be used with an insecticide. • Tebuconazole/propiconazole or teb/prop. Like TBTN, this is a colourless fungicide and must be used with an insecticide. • The synthetic pyrethroids, permethrin, deltamethrin, bifenthrin, and cypermethrin are used for termite and insect control and have no ability to stop decay. These preservatives are colourless and often have a dye or pigment added. e.g. blue framing. Glue line additives This type of preservative does not neatly fit into the three groups of preservative just described. This is because the preservative is added to the glue when products such as plywood or laminated veneer lumber or chipboard are being prepared for gluing. Preservatives in this group currently include two synthetic pyrethroids, imidacloprid and zinc borate. (*Note: Part 1 of the preservation standard applies in Australia only and Parts 2 to 5 are joint AS/NZS standards. Currently, wood treated to comply with a specific Hazard Class (TPAA Technical Note #2) may be used anywhere in Australia. Clearly the biological hazards in Mt Isa or Broken Hill or Innisfail are not the same for a nominated Hazard Class. Research is currently underway to allocate use of various preservative treatments more closely aligned to biological hazard (H class) but until this information is available, the following table may be used as a guide on how to match Hazard Class with a treated timber product. There may be other products made of treated wood and you can contact the TPAA for further advice.